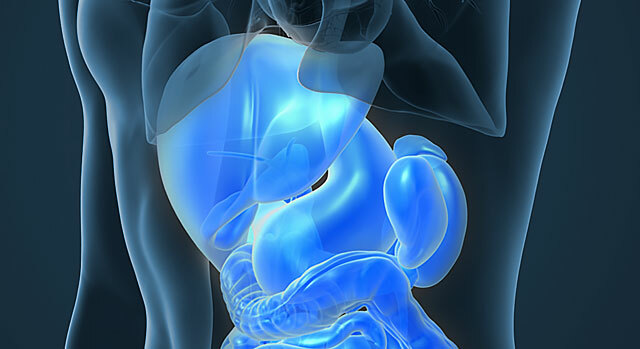 The Digestive Disease Center offers the diagnosis and treatment of gastroenterological organs, including the esophagus, stomach, small bowel, colon, gall bladder, liver and pancreas. The physicians on staff include national and international authorities on biliary tract disease (gall stones), pancreatic diseases and inflammatory bowel disease such as ulcerative colitis and Crohn's disease. Treatment is available for a wide range of disorders, including gastroesophageal reflux disease (GERD) or acid reflux disease. GERD occurs when the muscles surrounding the valve between the esophagus and the stomach become weak and allow acid from the stomach to leak upward into the esophagus. When weakened this valve can allow stomach acid and food to surge upwards into the esophagus, causing painful heartburn and indigestion. For many people, symptoms can occur several times a day, particularly at night when a person lies down to go to sleep, and continue from week to week and year to year. Diet and lifestyle may also make a person more susceptible to GERD. Consumption of fried, fatty or spicy foods, caffeinated beverages, alcohol and chocolate, as well as obesity, pregnancy, smoking and the natural aging process can worsen the symptoms of GERD. If left untreated, acid reflux may lead to respiratory problems, ulceration of the esophagus or even esophageal cancer. Chronic GERD symptoms can be alleviated with a minimally invasive surgical procedure, also known as videoscopic surgery. "This procedure can literally change your life," says Stephen Evans, MD, a surgeon at Lakewood Ranch Medical Center. "For many patients, the daily heartburn prevents restful sleep, makes eating difficult and generally affects all aspects of their lives. This simple procedure gives them a better quality of life." During this procedure, the surgeon makes five small incisions, each less than one inch in the abdomen, to accommodate small tubes called trocars. These create a passageway for special surgical instruments and a laparoscope. A laparoscope is a fiber optic instrument that is inserted in the abdominal wall and is used to examine visually the interior of what is known as the peritoneal cavity. This device is used to transmit images from within the body to a video monitor, allowing the surgeon to see the operative area on the screen. They then use the surgical instruments to wrap a portion of the stomach around the lower esophageal sphincter to prevent the flow of acid into the esophagus. In most cases, videoscopic surgery reduces scarring and shortens hospital stays and recovery time. Patients are usually released from the hospital in one to two days as compared with nine days for traditional surgery. In many cases, recovery time can be as little as seven to 13 days, compared with 28 days for traditional surgery. The surgical team at Lakewood Ranch Medical Center has performed hundreds of laparoscopic procedures for GERD. Individuals who think they may have chronic heartburn should see their physician or gastroenterologist to determine the cause and severity of the problem, the proper steps to take to improve their condition, and to determine if he or she is an appropriate candidate for videoscopic surgery. If you need a referral to a physician at Lakewood Ranch Medical Center, call our free physician referral service at 941-708-8100.